Archie and Edith Bunker began each show with a loud off-key rendition of a song about the things of the past that were lost to them forever. Each generation can name a certain band or entertainer that can be recalled as providing the soundtrack of their young lives. Archie and Edith lamented the loss of an era where they learned to swing (and probably fell in love) to the music of a man who in four short years had more number one hits than Elvis or the Beatles. were part of the westward movement shortly after the Civil War having moved to Iowa when their son Elmer was three. Elmer grew up there and married a local girl Mattie Lou Cavender who became a respected teacher. In 1906 the Millers sold their home in Clarinda and moved to Nebraska to homestead 640 acres under the Kincaid Act of 1904. The future bandleader lived with his father, mother, and older brother in a sod house on the flatlands. His mother started a school there called Happy Hollow. The family moved to North Platte, Nebraska where two more children were born. By 1917 they had moved to Grant City, Missouri where Glenn went to grade school. There he met a businessman named John Mosbarger who was the director of a community band He wanted Glenn and his older brother Deane to join the band. Glenn had an old trombone but Mr. Mosberger bought him a new one so he would have something nice to play in the band. Glenn worked for Mr. Mosberger to pay him back. In 1918, the Millers moved to Morgan, Colorado where Glenn enrolled in high school. He decided he might like to play football and at the end of the season was chosen as "the best left end in Colorado" by the Colorado High School Sports Association. During that time, Glenn became very interested in a new musical sound called Dance Band Music. He and some classmates formed their own band. He was so excited about his music he missed his own graduation to go to Laramie, Wyoming to play. His mother accepted his diploma for him. By graduation, he had decided to be a professional musician. His first professional contract was with a Dixieland group named Senter's Sentapeeds. Soon an opportunity opened up for him to play in the Holly Moyer Orchestra in Boulder which gave him enough money to attend the University of Colorado where he joined the Sigma Nu Fraternity. Glenn was so busy going to auditions and playing gigs he failed three out of his five classes. He gave up on college to become a full-time musician. He studied the Schillinger technique with Joseph Schillinger under whose tutelage he composed what came to be his signature song MOONLIGHT SERENADE. He toured with several bands during 1926 and wound up in Los Angeles where he landed a good spot in Ben Pollack's Orchestra. He was the main trombone soloist until Jack Teagarden was hired in 1928. Glenn found his solos being cut more and more. He realized his future might be in writing and arranging music. 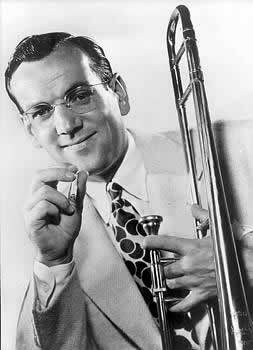 He had a songbook published in Chicago in 1928 called GLENN MILLER'S 125 JAZZ BREAKS FOR TROMBONE. He wrote a song ROOM 1411 with his roommate Benny Goodman which was released as a Brunswick 78 credited to Bennie Goodman's Boys. When the Pollack tour reached New York City, Glenn sent for his college sweetheart Helen Burger and the two were married. During the late 20s and early 30s, he worked as a freelance trombonist with several bands. He arranged and played on sessions with the Dorsey Brothers including THE SPELL OF THE BLUES, LET'S DO IT, AND MY KINDA LOVE all with vocals by Bing Crosby. He was hired by Red McKenzie to play on HELLO, LOLA and IF I COULD BE WITH YOU ONE HOUR TONIGHT which are now considered to be jazz classics. He played in the pit bands of two Broadway shows STRIKE UP THE BAND and GIRL CRAZY. He composed the songs ANNIE'S COUSIN FANNY, DESE DEM DOSE, HARLEM CHAPEL CHIMES, and TOMORROW'S ANOTHER DAY for the Dorsey Brothers Band. In 1935, he put together an American band for British bandleader Ray Noble. He made his first movie appearance as part of the Ray Noble Orchestra in the Paramount Pictures release of THE BIG BROADCAST OF 1936, starring Bing Crosby, George Burns, Gracie Allen, Ethel Merman, Jack Oakie, and Bill "Bojangles" Robinson. The movie also featured Dorothy Dandrige and the Nicholas Brothers who would star with Miller again in two Twentieth Century Fox pictures in 1941 and 1942. Finally, in 1937 Glenn realized his dream of forming his own band. Failing to distinguish himself from other bands of the era, he soon ran into financial troubles and had to disband. Very discouraged, he returned to New York to figure out what to do next. He understood that he would have to develop a unique sound. He decided to make the clarinet play a melodic line with the tenor saxophone holding the same note while three other saxophones harmonized within a single octave. He hired a saxophonist named Wilbur Schwartz and put him on lead clarinet. Wilbur's tone and way of playing brought a sound that was hard for others to imitate. This time when Glenn put together his own band the outcome was much different. The Miller Band began recording on Bluebird Records in 1938. A prominent East Coast businessman, Cy Shribman, started financing the band giving them much needed help. In the summer of 1939, the band was asked to play the summer season at the famous Glen Island Casino in New Rochelle, New York. It was said they attracted 1800 people, the largest opening night crowd ever at the prestigious casino. The popularity grew rapidly and they performed at Meadowbrook, New Jersey that same year. Both places had frequent radio broadcasts so the Glenn Miller Orchestra soon developed a nationwide following. In the fall of 1939, they began a series of radio broadcasts sponsored by Chesterfield cigarettes which increased their popularity even more. They were in constant demand for recording sessions. The Glenn Miller Orchestra appeared in a film SUN VALLEY SERENADE with Milton Berle and Dorothy Dandridge. The film featured the Nicholas Brothers in a show stopping version of CHATTANOOGA CHOO CHOO. Their next movie appearance was in ORCHESTRA WIVES with Jackie Gleason playing as the group's bassist. Glenn Miller seemed to have a fix on what kind of music would please his listeners. He was panned by jazz critics for endless rehearsals and being too polished. They thought he was so perfect he took away any feeling from the performance. They accused him of being too commercial by using novelty instrumentals and vocal numbers. They said Glenn Miller had no personality on or off stage. His audiences loved him however and so did his musical peers such as Louis Armstrong, Mel Torme, and Frank Sinatra. Pearl Harbor was attacked on December 7, 1941 and the United States was dragged into an already raging World War II. At the height of his civilian career, Glenn Miller was too old to be drafted but he decided to join the war effort. He volunteered for the Navy but was told they didn't want him. In August of 1942, he wrote to Army Brigadier General Charles Young in an effort to convince him the Army needed him to be in charge of a modernized Army band that could "put a little more spring in the step and a little more joy in the hearts" of the fighting men. His offer was accepted. 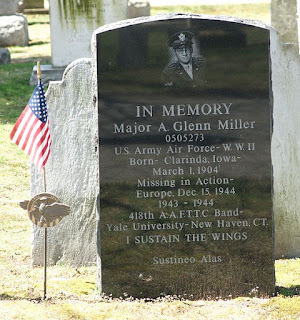 Glenn played his last civilian concert in Passaic, New Jersey on September 27, 1942. The program ended with an emotional MOONLIGHT SERENADE. Glenn reported for duty on October 8, 1942. He was given the rank of Captain in the Army Specialists Corp but was soon transferred to the Army Air Forces where he gained the rank of Major. He spent the next year and a half arranging music, putting together and directing his own 50 member band. He modernized military music sometimes clashing with the old guard that didn't want anything changed. He raised millions of dollars in War Bond drives. He appeared on weekly I SUSTAIN THE WINGS radio broadcasts to attract new Air Corp recruits. He was on a mission to boost morale and bring a touch of home to the troops. But he wanted to do more. In the summer of 1944, he gained permission to take his band to England where he gave 800 performances. The group was headquartered at 25 Sloane Street in an area under constant barrage from German V-1 buzz bombs. He became concerned and made arrangements for them to move to new quarters in Bedford, England on July 2, 1944. The very next day a bomb landed in front of their old quarters and killed 100 people. He recorded a series of propaganda recordings at Abbey Road Studios. (Yeah THAT Abbey Road!) Some of the songs were sung in German by Johnny Desmond and Glenn Miller spoke in German about the war effort denouncing fascist oppression in Europe. The Glenn Miller Army Air Force Band stayed busy entertaining the troops at the bases and performing radio broadcasts. They made a recording with singer Dinah Shore (not released for more than fifty years later) also done at Abbey Road. These were the last recordings made by the band while being led by Miller. Even though he was in the military and working tirelessly, Glenn and his wife Helen were able to adopt two children, Steven in 1943 and Jonnie in 1944. A tour of other European cities was scheduled late in 1944. Their last performance in England was at Milton Ernest Hall near Bedford on the night of December 14, 1944. Glenn Miller HATED airplanes but early on the morning of December 15, 1944, he decided to fly to Paris to make arrangements to bring his band there for a Christmas Eve broadcast. It was cold and snowing but Glenn and his traveling companion, Lt. Col. Norman Baessell, along with the pilot, John Morgan. boarded the single-engine plane and took off from RAF Tinwood Farm in Clapham near Bedford heading for Paris. Their plane disappeared over the English Channel and was never heard from again. No trace of the plane or the men have ever been found Over the years different theories have been put forth as to what might have happened. The first story I ever heard was they had been shot down or captured by the Germans. For a long time there was the story their plane had been hit accidentally by a bomb jettisoned by Allied planes returning from an aborted bombing raid over Germany. This idea was discredited by the log of a plane spotter who had reportedly seen them heading on a course that would keep them out of the area where bombs were jettisoned. I watched a TV documentary that outlined the current determination that the fault may have actually been the plane itself. The plane was a UC-64 Norseman, USAAF Serial Number 44-70285. That type of aircraft had been known to have a faulty carburetor that could ice up in cold weather and had a history of causing crashes in other aircraft. It is thought the cold snowy weather combined with the faulty plane part caused the aircraft to go down into the water. Just like Amelia Earhart, what happened to Glenn Miller and the two other men became another of history's great mysteries. The orchestra performed the Christmas Eve concert without him but were soon decommissioned and sent back to the United States. In 1946, his estate authorized an official Glenn Miller "ghost band" under the direction of Tex Beneke who had been a part of Glenn's civilian band. The band was immensely popular playing to large audiences around the country. Soon what started as The Glenn Miller Orchestra Under The Direction of Tex Beneke became the Tex Beneke Orchestra. The Miller estate parted ways with Beneke in 1950. There are many archives and tributes to the late bandleader. His daughter Jonnie purchased the home in which he was born and it is now part of the Glen Miller Birthplace Museum. His name is on the "Wall of the Missing" at the Cambridge American Cemetery and Memorial in England. A headstone was erected for him in Arlington National Cemetery. A monument was also placed for him in Grove Street Cemetery in New Haven, Connecticut near the campus of Yale University. He has a star on the Hollywood Walk of Fame. For his military service he was awarded the Bronze Star, American Campaign Medal, European-African-Middle Eastern Campaign Medal, World War II Victory Medal, and Marksmanship Badge with Carbine and Rife Bars. Three of his recordings, MOONLIGHT SERENADE, CHATTANOOGA CHOO CHOO, and, IN THE MOOD were placed in the Grammy Hall of Fame. Jimmy Stewart portrayed him onscreen in THE GLENN MILLER STORY. 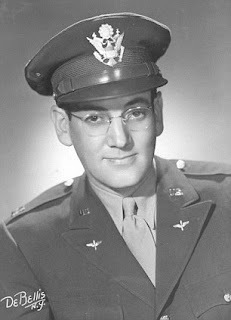 Glenn Miller pioneered a unique musical style through hard work and perseverance. At the height of his career he joined the United States Army Air Corps, modernizing military bands and boosting the morale of Allied fighting men. Having given the supreme sacrifice for his country, he is remembered as a great American Patriot. He was a man who achieved many things in forty short years. He loved trout fishing, playing baseball, sleep, money and reading the Bible. I will end this with his favorite quote which happened to be from another great bandleader Duke Ellington. IT DON'T MEAN A THING IF IT AIN'T GOT THAT SWING!